This is a bird that has eluded me on two trips to Germany – both of which included exploring forests where they were supposed to be present – and a trip to a region of Hungary where they are supposed to be common…Whenever I get to Europe again this will be my most-wanted bird. And if I dip again? Well, that doesn’t even bear thinking about. I better not miss this bird again. Yet, here I am, back from Austria, minus one Black Woodpecker sighting. It’s not that I didn’t try. It’s not that I didn’t have help. It’s not that I wasn’t in the right spot. There is only one possible reason that Black Woodpecker has once again eluded my eyes. Black Woodpecker is officially a capital-N-Nemesis-capital-B-Bird. What happened? We were in proper habitat several times. The first few times there was neither sighting nor any indication that a Black Woodpecker was around. But on Saturday morning, 4 February, we were visiting an Austrian castle high on a forested hill outside of Bregenz. We were officially there for Wallcreeper and that search was easily successful despite our group having several birders who had never seen this stunning creature. But, before I continue, I should note who the “we” in this group was. We were the American and Chinese contingent of birders who had just completed a trip with Swarovski and, who for lack of better travel options, had stayed on a bit longer than the rest of group. We had Jeff Gordon, the President of the American Birding Association; Bill Thompson III, Editor of Bird Watcher’s Digest; Sharon Stiteler, the Birdchick; Jessie Barry and Chris Wood from the eminent Cornell Lab of Ornithology; Clay Taylor of Swarovki Optik North America; Samson So, Hong Kong birder extraordinaire and founder of the Eco Insitute; Terry Townshend of Birding Beijing, another great birder; and our guide for the day, the estimable Austrian birder Leander Khil. Then Chris yelled to us that he had just seen one flying deeper into the forest. I ran to catch up but the bird had disappeared. As a group we searched, played tape, and did everything we could think of to conjure the woodpecker back into the open with no luck. Bill briefly heard it call from deep in the woods but it never showed. 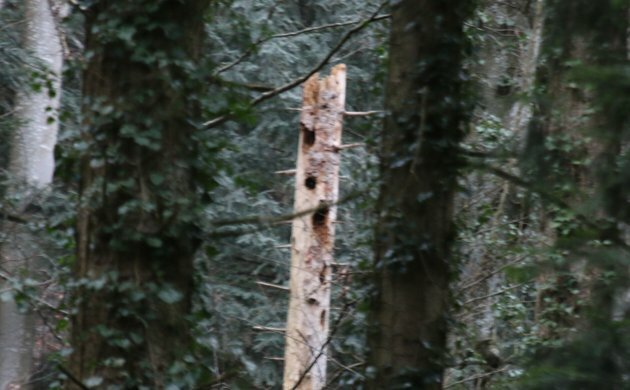 Instead, once again, I was left with evidence that the Black Woodpecker left behind like the one at the top of this post and the one below. I don’t know when I will get to Europe again but look forward to the day that I get back, deep into a forest, and see the mythical creature that is a Black Woodpecker. I can picture its gorgeous red-topped head on a black body and the strong bill. I will meet its pale, staring eye with my own two eyes and there will be a connection between the two of us. And then, in that perfect, peaceful moment, I will raise my hand, making sure the bird can see it clearly, and I will extend my middle finger high. Because I hate Black Woodpeckers if they do, in fact, exist. I hate them with the passion of twenty burning suns. It is not right what they have done to me and I will have my revenge. Mwa-hahahahahahaha! Maybe you failed because you tried? Oh man. Even Yoda is against me! Well, you heard it, so you may officially count it. Also, your attempt at relocating it after someone else saw it in flight was rather pointless since – according to my experiences – the species flies far whenever it flies. Yuuuuge territories. They’re amazing, great. Tremendous. No wall can stop ist flight. Oh, sorry. Got carried away. Anyways. does it help you that I also only heard my first-of-year Black Woodpecker last Weekend? No? Thought so. Cheers, corey. You’ll surely see one some fine day. Capital letters are not my friend today. But I didn’t hear it. Well, I did that time in Germany with Hendryk but I refuse to count such a great bird as heard only. Ouch. I thought for sure you’d get it this time. @Jochen A lot of very smart people have told me that Black Woodpeckers are the best woodpeckers. Just the best. Of all time. Believe me. @Tim: yeah, but once you’ve seen them as often as I have – I measure the amount of my observations with both my hands – you realize that they are just birds and that the glorification of them is just totally fake, fake news. I bet Trump has seen Black Woodpecker. No he hasn’t. On the contrary, he is telling everyone to go watch Pileateds after some Nordic country has dropped Ivanca’s Black Woodpecker reports. Terrible! 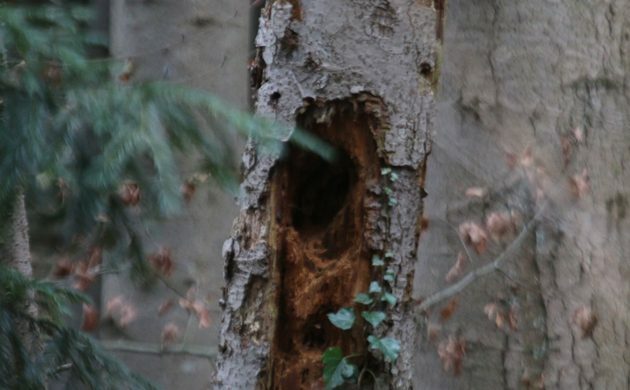 @Tim: you are surely aware that many Black Woodpecker observations are not covered by the media? Big problem.